I have a message directly from the president: Today is the day we must once again shock the world. My father is asking you to stand up like you did in 2016 and make our rendezvous with destiny a reality. On this day, it’s going to require each and every one of us — just like it did two years ago when we proved what can happen when we stand together. We can make history again by keeping power in the hands of the American people, instead of surrendering it to liberal elites who offer nothing but chaos and obstruction. The Democrats have no economic plan, no plan to address the illegal immigration crisis, and no desire to work on true bipartisan solutions to make America great again. All they have is divisive identity politics and radical socialist policies they are desperately trying to make palatable to the masses. The truth is that Democrats take American voters for fools. They believe that the bigger paycheck you’ve been taking home over the past year doesn’t really matter — and, worse still, that you don’t deserve it. They honestly think you should ignore the crime, violence and depressed wages that come with the open borders they champion so proudly. If we allow Democrats to take control of Congress, we’ll see the progress we’ve made come to a grinding halt. Democrats and establishment politicians from both sides pulled the rug out from under the American economy and hard working American families — they surrendered our sovereignty and our treasure to the world while mocking you as "deplorable" and "irredeemable" — but my father is putting an end to this betrayal. I have been a personal witness to the true grit and devotion he’s shown for this country and the tenacity he’s displayed against the threats to our nation. Never a moment’s rest, never wavering, and most importantly, never giving up. He has rallied with you in small towns and cities all across this nation. From the miners of Pennsylvania and Ohio, to the manufacturers of Michigan and Wisconsin, to the farmers of Florida and Missouri, to the ranchers of the West — my father is with you until the end. He’s kept his promise to put the interests of our country before the interests of the globalist elites. America’s adversaries fear us again, our competitors respect us again, and our allies trust us again. That’s why today’s vote not only impacts our country, but the rest of the world. President Trump needs your help. Although my father’s name is not on the ballot, his agenda and the future of America most certainly is. He needs you to put Republicans in Congress who can be relied on when the going gets tough, people who will support his efforts to restore American greatness for all. Everything we’ve gained so far is up for grabs, and if you don’t stand up today, it — along with our country’s very future — will be taken from you. Let’s shock the world once more. 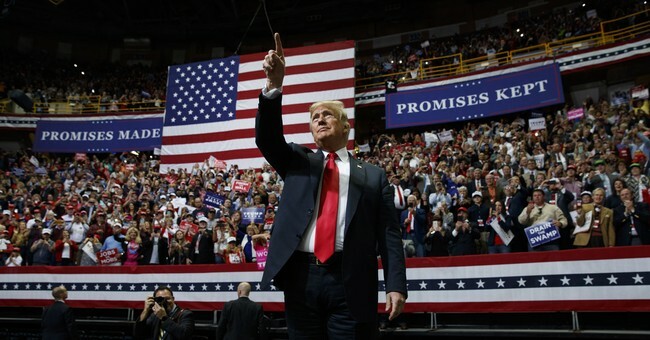 Let’s send another loud and clear message to the Democrats, the media and the liberal establishment: we’re making America greater, and we’re far from finished. It’s up to you. Vote today, and get your family and friends to vote too, no matter what! Donald Trump Jr. is the Executive Vice President at The Trump Organization.